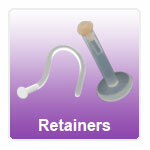 Below are our range of piercing retainers to help hide your piercing when required. We have a range of hide it retainers for navel, nose, labret, tongue and ear piecings. Materials used are PMFK acrylic, Bioflex, PTFE and silicone.